We are generally not prepared to see a "black swan." We expect to see white ones. If a black swan were to appear, on a pond near us, we would be surprised. Later on, we could probably explain how it got there. Thus, a metaphor is born. 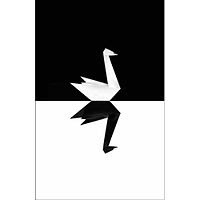 The epistemologist Nassim Nicholas Taleb has written an entire book about this so-called "Black Swan" metaphor: Black Swan: The Impact of the Highly Improbable. Taleb's book focuses on "the extreme impact of certain kinds of rare and unpredictable events, and our tendency to find simplistic explanations for these events retrospectively." Click on the image to read an entire article on the phenomenon in Wikipedia. I tend to spend a lot of time thinking about "politics," which I consider to be the way that we collectively decide what we want to do, and thus what realities we want to create. An obstacle to what I think of as a "good" politics (in other words, a politics that assumes that we are truly "free" to create the kind of world we want) is our tendency to believe that reality is captured best through "extrapolation." What (currently) "is" seems "real," and we begin to assume that what currently exists actually defines the possibilities of reality, and that the future will be found (not made) by extrapolating what is happening to us today. The basic problem with this way of thinking about politics (or the world) is that it relegates human beings to the position of "observers." In fact, we create our human world through human action, and we don't just "discover" it. The opposite is true in the world of Nature. The "black swan" metaphor reminds us that the unexpected and the improbable are also "real." It's an antidote to our acceptance of what "is" as the defined truth about the extent of the possible.